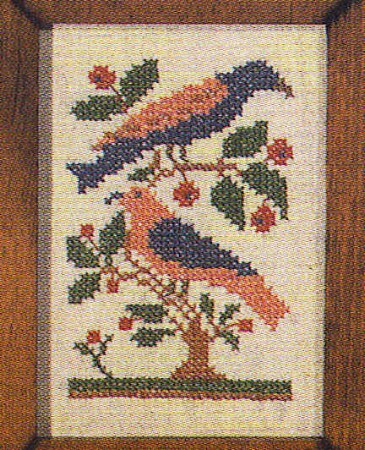 Stitch this cross stitch stamped craft kit of two birds poised on a limb preparing for a flight.This lovely design,in beautiful folk art floral colors lends itself to any wall.Because of color and size,this printed cross stitch sampler projects a stunning appearance in a place that is difficult to decorate. This is a lovely sampler and such fun to do. The colors are muted, like an antique rug. I wish there were a companion piece. It would be nice to have a pair. Love them. Nice "antique" look which I love since I collect antique samplers.